This highly durable and tackable acoustical panel improves room acoustics in the form of a low profile aesthetically pleasing interior wall finish. 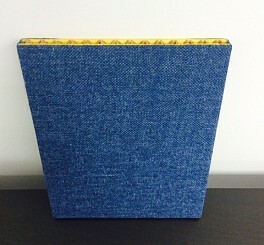 Thick blankets of fiberglass are fused to each side of a honeycomb core using heat and pressure to provide a unique, patented substrate which effectively absorbs sound. The DS-90 panel is molded up to 60 in. wide and is only 5/8 in. thick matching well with interior trim. This makes it ideal for full wall coverage.